This crypto-ransomware first came to public notice on 24 October 2017 following reports that it had infected organizations in Ukraine and Russia. Proactive protection was provided by F-Secure's DeepGuard behavioral analysis engine before this threat was publicly disclosed. Multiple signature detections were also subsequently released to provide additional, specific coverage. F-Secure detects this ransomware with multiple behavioral and signature detections. Once detected, the F-Secure security product will automatically remove the file. Once ransomware has successfully encrypted files on a machine, the encryption may be sufficient to make it very difficult to decrypt the files without the decryption key. In such circumstances, the recommended course of action is to report the crime to the relevant authorities and restore the affected data from a backup. Ensure DeepGuard and real-time protection is turned on in all your corporate endpoints. Ensure that Security Cloud is turned on. Ensure that the firewall is turned on in its default settings. Ensure that all your corporate endpoints are using the latest database updates. Instructions on how to check if the product is using the latest database update are available in Community: How do I know that I have the latest updates? Bad Rabbit first came to public notice on 24 October 2017, as multiple security firms reported their discovery of a new ransomware family affecting a number of organizations, mainly in Russia and Ukraine. According to reports, at least three media companies have been affected by the ransomware, as well as as transportation services. From our analysis, the initial infection vector for the Bad Rabbit ransomware is via compromised websites that host an injected malicious script. The script redirects users to a secondary site where the actual ransomware file is downloaded. The actual file itself may be disguised as an Adobe Flash Player update. If any SMB shares are found with these usernames or passwords, Bad Rabbit then checks for open RPC pipes. If any are found, it then uses the Eternal Romance exploit to spread within the network. The use of the NSA-linked Eternal Romance exploit to spread marks a similarity between this ransomware and the Petya.F ransomware, though Bad Rabbit uses a different implementation of it. In contrast however, Bad Rabbit does not use the EternalBlue exploit, which is also used by Petya. The task names and registry keys reference the popular television series, Game of Thrones. Bad Rabbit uses a driver from the open-source DisCryptor disk encryption software to perform the encryption. 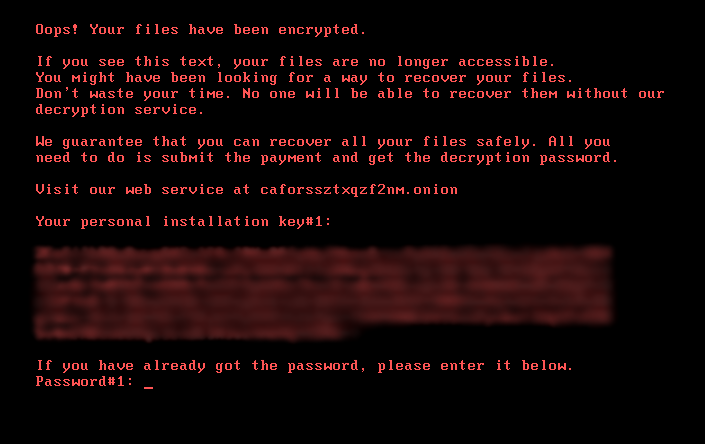 After rebooting the machine, the driver runs AES string encryption using a randomly generated key, which is then encrypted with the ransomware's hard-coded public key and then encoded to the machine's Master Boot Record (MBR) This code is intended for later use during the ransom payment process. Bad Rabbit's encryption behavior shows similarities to the known Petya ransomware. Unlike other ransomware, Bad Rabbit does not change the extensions of the encrypted files, making it less obvious that they have been tampered with. It does however add the string 'encrypted' to the end of the encrypted file. Date Last Modified: 27 Oct 2017: Updated information on use of Eternal Romance exploit.